Misprinted cover, Black missing, so some graphic elements don't appear. A serviceable album of classic era prog rock from one of the genre's most prominent bands. "Dance On A Volcano" is a superb opener. "Ripples" is the real standout here though. A masterpiece! It's not the band's best but never stopped me from listening to it 100 times! Now, the thing is, CAS 4001 never existed. Charisma listed some releases with different prefixes, e.g. CGS, PG, or, in this case, CDS. Someone at the mastering studio must be "guilty" of that very minor but interesting faux-pas. Just for Mad Man Moon and Entangled, they're beautiful. Very close to selling England by the pound in terms of quality and emotion. Great sound on this album full and rich prog rock. 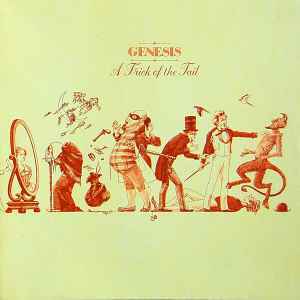 The entire Genesis catalog was remixed by NICK DAVIS. In most cases, the original mixes are better. However, the re-MASTERING on these 2007 issues is AWFUL. Over the top limiting/compression removed all the dynamics from these new mixes, leaving us in the dark on how Nick's remixes actually sound. Stick with the mid-late 80's Atlantic issues, with the original mixes and masterings. GREAT dynamics. Does anyone know the exact release date of this album? My Australian pressing has a textured patten jacket and insert. Is anybody else's the same? I have a copy with matrix numbers CDS 4001 A//1 and CDS 4001*B//1 yet the label states "All tracks Fuse Music Ltd" not "All tracks Copyright Control". Also, the gatefold states the 70 Old Compton Street address, not the Soho Square one. So, is mine a first press?